So I went out and took a risk because Roodonfood takes risks for you. I purchased the Asian Gourmet Barbeque flavor rice crackers. Barbeque flavor can be cloyingly sweet so I was hesitant to open the package. Once again, you get around 50 crackers for $1.79 at Eagle Provisions. The crackers are low fat, oven baked and labeled gluten free. The crunch is just right and because they’re made of rice, very light. The bbq flavor provides a moderate amount of sweetness to savory. For best results once again I suggest pairing with a sharp cheddar. 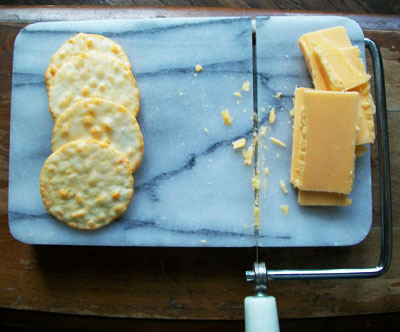 Pictured are the crackers with delicious Cabot Sharp Cheddar Cheese.